Hey beautifuls, for the past few months I have seen the skincare brand Ryaal in every blogger's testing table. I have been using their argan oil for long and am a big fan, but had never tried any of their skincare items. 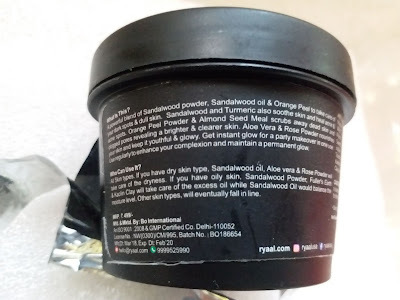 So I decided to give it a try and got the Ryaal Make Me Glow Revitalizing Face Mask. A Powerful Blend Of Sandalwood Powder, Sandalwood Oil & Orange Peel To Take Care Of Your Dark Spots & Dull Skin. Sandalwood And Turmeric Also Soothe Skin And Heal Acne & Acne Spots. Orange Peel Powder & Almond Seed Meal Scrubs Away Dead Skin And Clogged Pores Revealing A Brighter & Clearer Skin. Aloe Vera & Rose Powder Nourishes Your Skin And Keep It Youthful & Glowy. 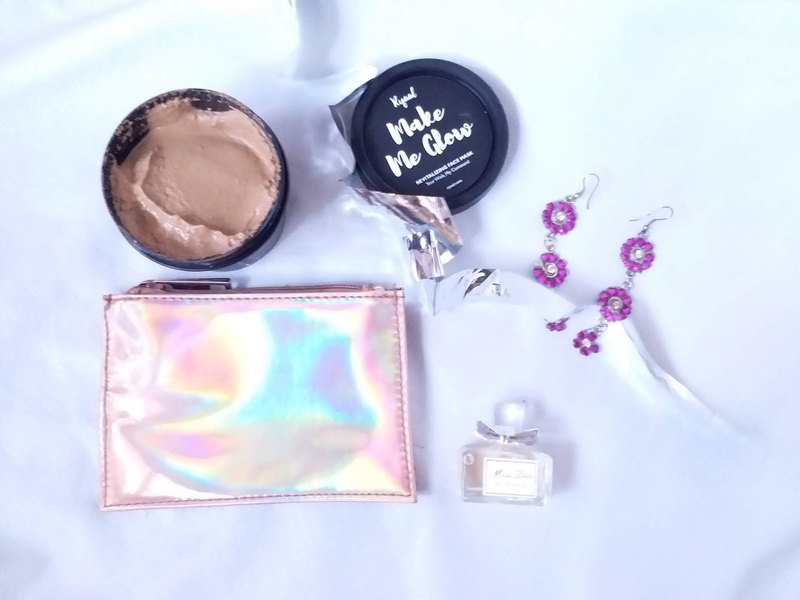 Get Instant Glow For A Party Makeover In One Use. Use Regularly To Enhance Your Complexion And Maintain A Permanent Glow. 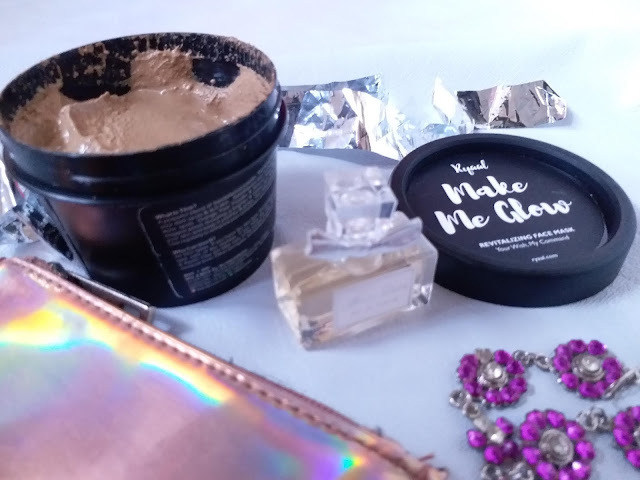 Packaging: The Ryaal Make Me Glow Revitalizing Face Mask comes in a black tub. My experience: As a kid I used to get lot of rashes and redness on my arms and back. My mom used to apply sandalwood powder paste on those areas and I remember it used to get better. I enjoyed the smell. 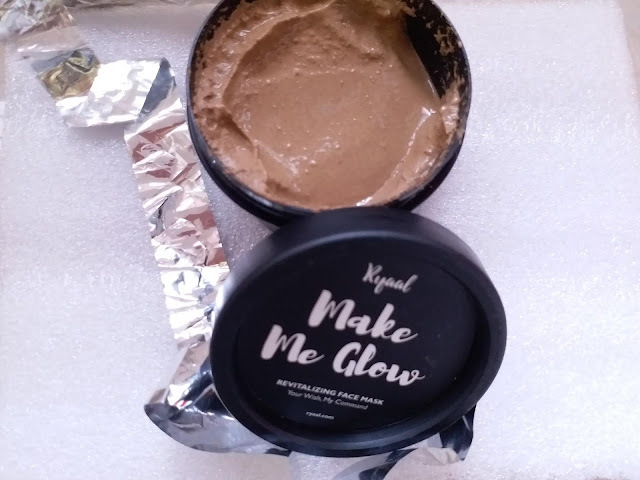 Ryaal Make Me Glow Revitalizing Face Mask has brought back the same concept of getting rid of skin related issues with the aid of Sandalwood as the power agent. 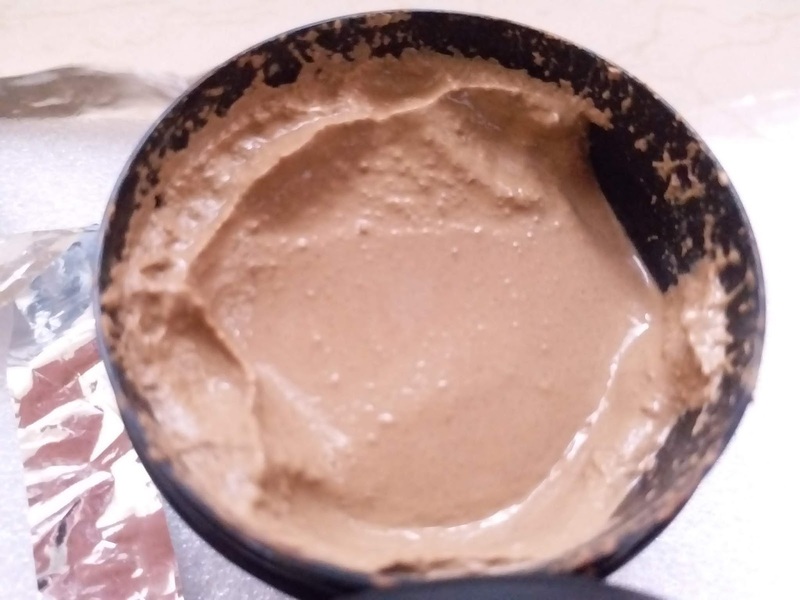 This mask has a clay consistency which is great because you can apply directly from the tub and dont require any diys to make a mask. 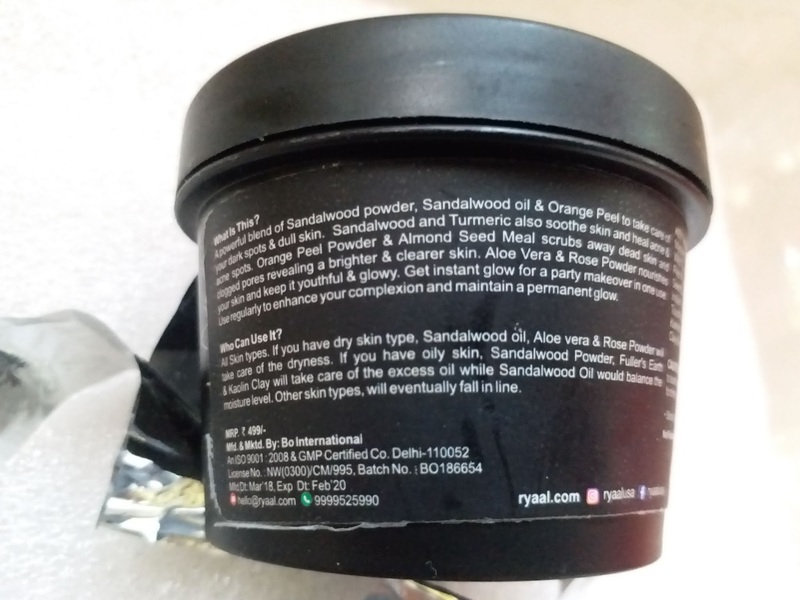 The smell is funny though as I was expecting a nice sandalwood fragrance but it came out to be a completely different scent with a very subtle hint of sandalwood aroma. You have to apply a thin to medium layer of it on your entire face and leave it for 10-15 minutes till it dries out. If you will apply a thick layer chances are that it will take ages to dry out :-( . On rinsing, you can feel that it has given a very fresh face with a brighter complexion. 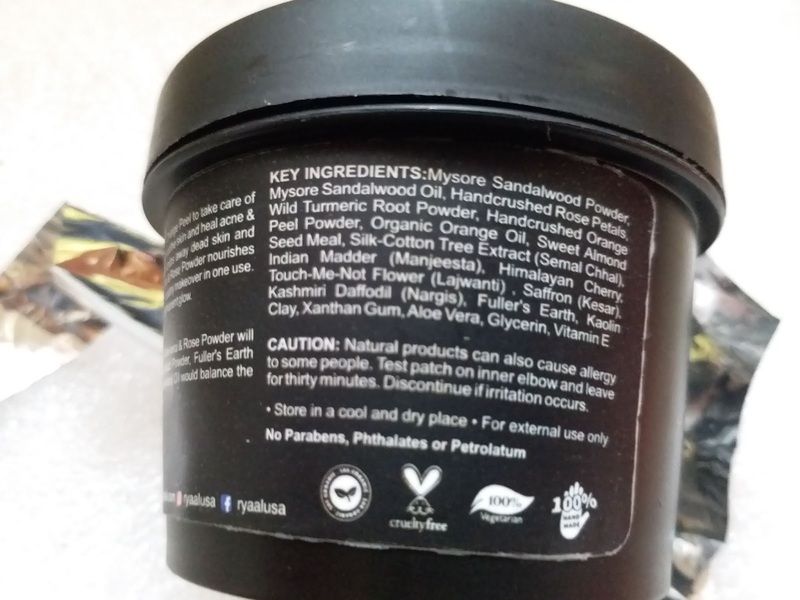 Now the ingredient list of this mask is interesting. It has orange peel powder and turmeric powder also. All these 3 active ingredients are known to even out complexion and make it brighter. And the mask exactly does that. I can see other ingredients like aloe vera, tea tree oil, fuller's earth and kaolin clay too. I think the presence of the latter 2 makes it a bit drying for my kind of dry skin. So once i rinse it off, I feel a bit dry on the cheeks and around my mouth. However, my complexion is much freshened and brightened, terming is as glowing or radiant will not be proper though. But I feel those with oily, combination skin can get that results too.